I remember you. You made a surprise visit in March and then left without closing the door. Well, if you're going to ignore the calendar, I'm going to ignore you. I'm going to make food that thumbs it's maple-y oats at all things perky and green and annoyingly absent. 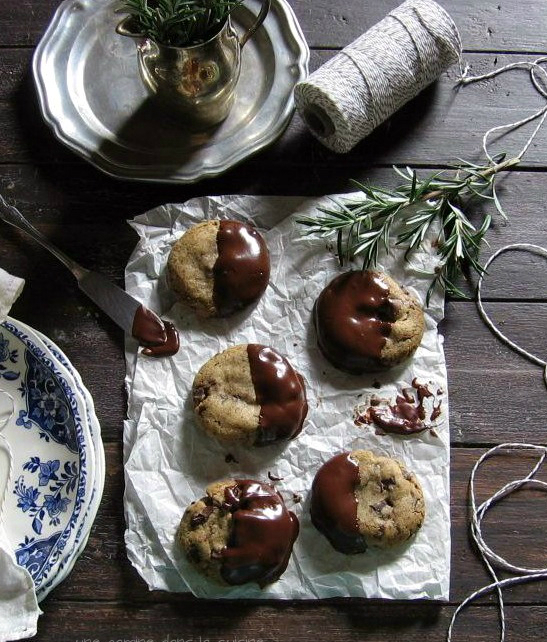 These cookies are an homage to your punctual counterpart, fall. In fact, I'm also wearing a nubby grey sweater that I usually reserve only for fall. Thanks for that. If you continue to keep things chilly, I'll continue to not use the fruit that you're not producing. I think that's only fair. So until next year (or week), Cheers. P.S. Niles, and my clothes, say Thank you for allowing him to maintain his thick winter fur. It's going to be a pleasure when summer arrives. Don't worry. Even if you are lucky enough to be someplace warm right now, these cookies are completely appropriate to bake, and smell, and enjoy. Don't tell spring, but I would have made them anyway. These cookies are a mouthful of spiced, chewy, maple-oat joy. I don't know about you, but I don't like wimpy oatmeal cookies. 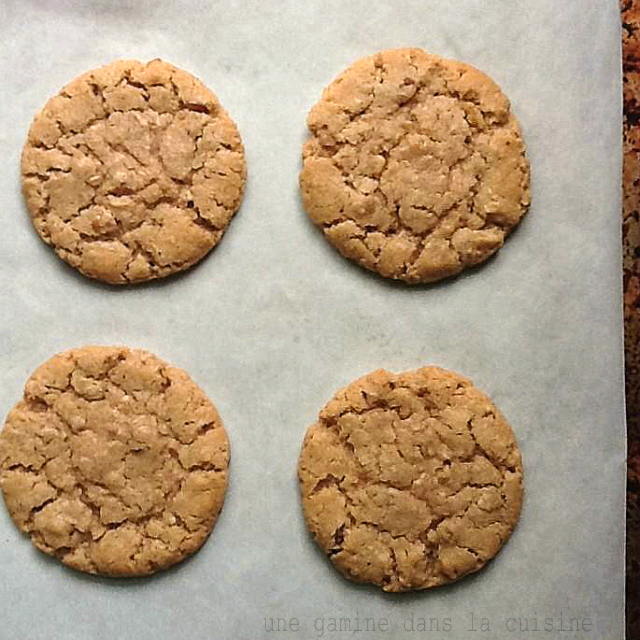 An oatmeal cookie needs to burst with cinnamon, and chunks of various-sized oatmeal flakes. And a little glaze is always welcome, Always. If you're just craving a simple cookie recipe, one that doesn't involve chocolate, this one is for you. 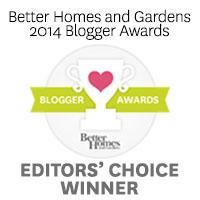 And if you're still sipping hot cocoa at night, huddled beneath a Slanket, this is for you too. 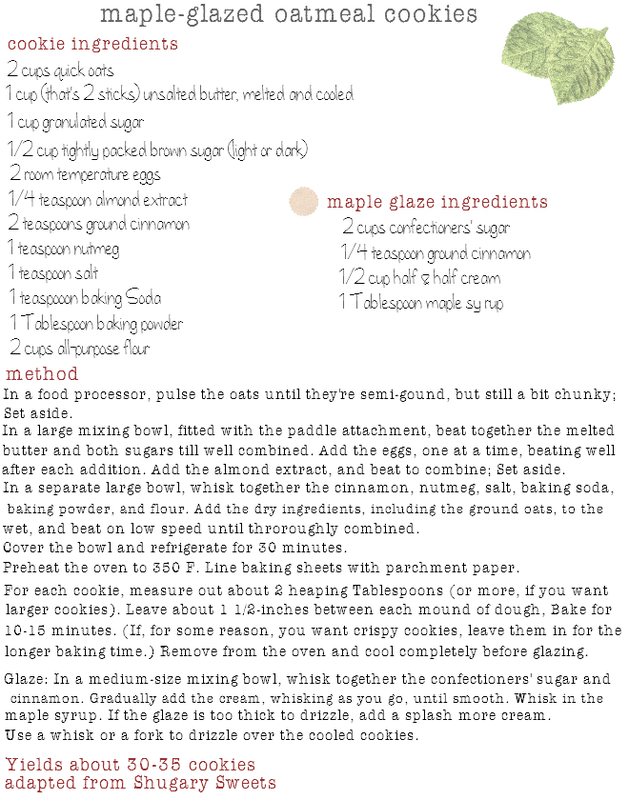 "Maple-oat joy" - love it, these look delish! Perfect looking and ever so tempting! How wonderfully large and perfectly round these are! I can almost smell them (and really wish I could taste them). I love making "off-season" things sometimes. You can't help your cravings and it's nice to taste fall in the middle of (an absent) spring! I just made oatmeal cookies last night. I think they're one of my favourites. I wish I had seen this recipe beforehand so I could have tried it out. Looks delicious! 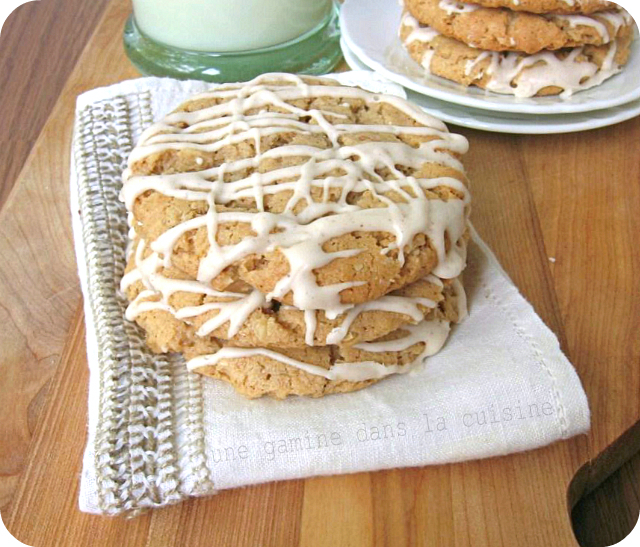 I do love a good oatmeal cookie, and all that cinnamon makes these sound extra-appealing. Oh those fickle seasons. I love them all except winter, which always seems like the relative who stays too long. This year, winter barely visited and we're on excellent terms. Next year, I'm afraid he will come and take over my life, refusing to leave for about four months. Ugh. we live in southern california and i will sometimes pretend it is a chilly fall/winter day and make fall/wintery food even though it is most definitely not that kind of day. 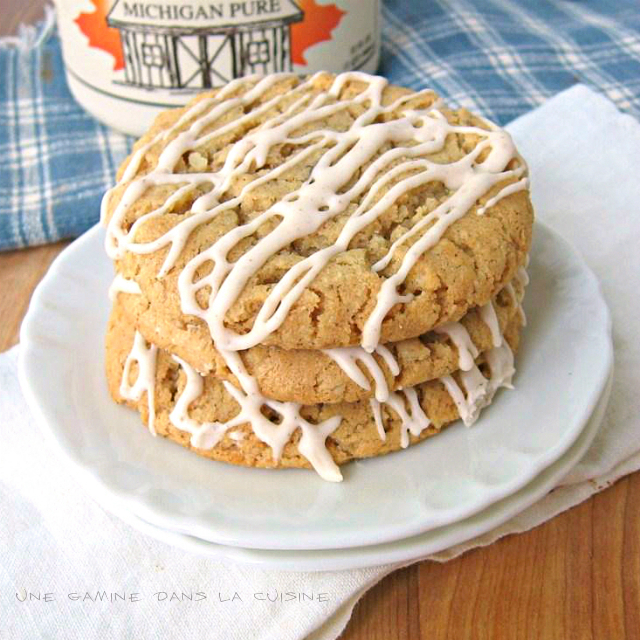 i'm in love with these cookies and am now considering declaring tomorrow a fall day here. I've so given up on the seasons, our weather is really messed up. These look great and I'm sure I could enjoy them at any time of year. I've been on a major fall baking kick lately thanks to the weather here too...lots of pumpkin, soup, and gingersnaps! When spring comes I will be caught completely off guard in my nubby sweater, munching my comfort foods with pleasure. Oh, yes... I'm with you!! Spring is such a tease. Here on the west coast she came in April even leaving me with a bit of tan on my arms. They she just ran away leaving that cold, gray, dreary, drizzly marine layer that stick around for weeks. I'm not a fan. YUM! I'm going to make these treats asap!! Yum! These are so on my list to bake now. :) Thanks for the recipe. I'm sure me and my boyfriend will love these. Saw these on Pinterest and yes to "An oatmeal cookie needs to burst with cinnamon, and chunks of various-sized oatmeal flakes..." All the way! Robust, hearty, chewy, thick. No wimpy cookies need apply!